Welcome to the video tutorials of mechanisms by mekanizmalar. 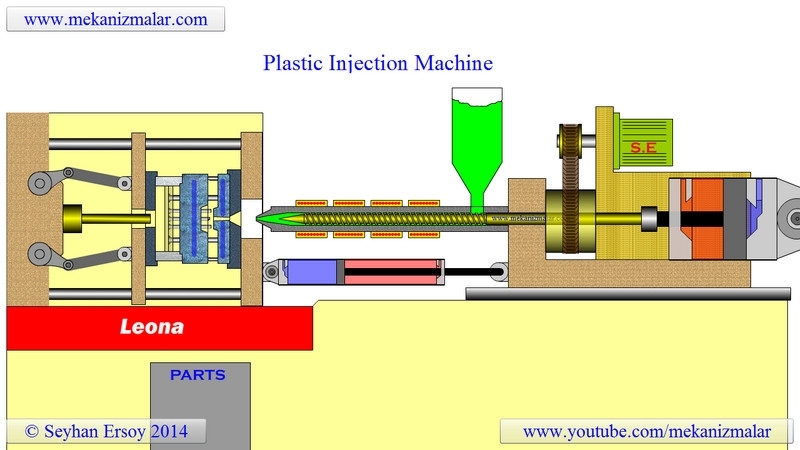 Modern plastic injection machines are true robotic devices and can operate 24 7 without a human intervention. Plastic materials the size of small grain granules are loaded into the hopper, either manually or via a pumping device in regular intervals. These granules flow into the barrel with the combined effect of gravity and the rotation of the screw. The barrel is heated by electrical heating bands. The part of the barrel closest to the mold contains molten plastic. When the mold is closed, the screw begins to rotate with the hydraulic motor seen here. This forces the molten plastic into the mold and at the same time pushes newly entered granules from the hopper toward the heating bands. At the completion of the rotation process, the screw is pushed forward with a hydraulic piston to compress the material inside the mold. The cooling water, shown here in blue, causes the plastic to harden. When the mold opens, the plastic parts usually stick to fixed plate of the mold due to the sprue. This is not a desirable effect and the mold designer must take this into consideration and make sure the parts stays with the moving plate. In the video, the middle pin, here, has a groove at the tip. This groove is to help pull the part away from the fixed plate. While the mold is opening, the shorter push pins push the part and the part is ejected into a part collector. The outer pins are used to make sure that the pin plates move properly. When the mold is opening, the injection unit is pulled to the non-operating position by the hydraulic piston shown here. At the same time, the screw is pulled back by the large hydraulic cylinder shown on the injection unit. While the screw is being pulled back, the rotation of the screw pushes the plastic material forward to compensate the space generated by the pulling screw. The rotation of the screw is accomplished by the hydraulic motor. Injection molding leaves tell-tale marks on the parts produced. These marks are a parting line, sprue, and ejector pin marks. None of these features are desired but are unavoidable due to the nature of the process. A parting line in mold making is the place where two or more parts of the mold meet. Parting lines occur due to minute inherent gaps between two mating faces of halves of the die. For symmetrical parts, this line can be seen on symmetry surface. A sprue is a passage through which liquid material is introduced into a mold. You can find this as a small nub or projection on the molded piece. Push pin marks are usually in a circular shape. These marks are produced by push pins during the molding process. It is always fun to look at these marks to reverse engineer the design of the mold. Next time when you hold plastic parts in your hand try to find these three important marks on the part. Thank you for visiting mekanizmalar channel and watching our videos. If you enjoyed this video, please give it a thumb up and subscribe to our channel.